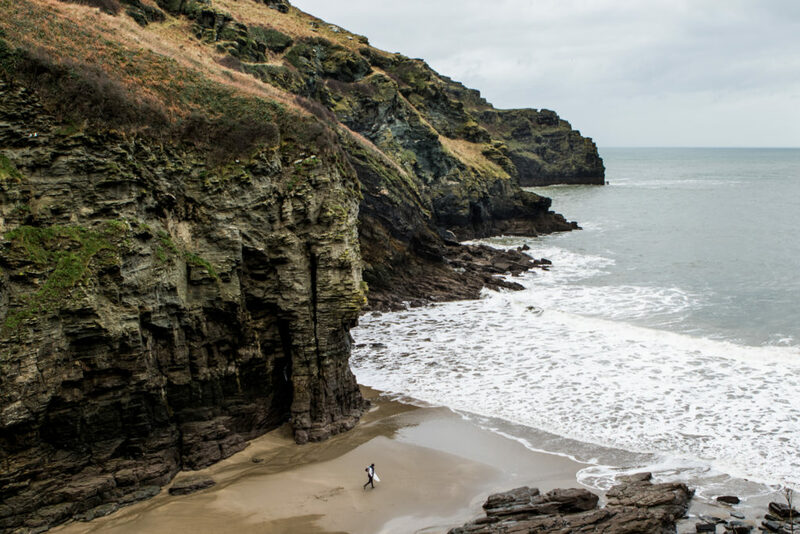 Follow the second leg of one mans quest to walk the entire length of the Cornish coastal path, scoring waves wherever he can along the way. Follow Dan Sharp on his journey to walk the 300 miles of the Cornish coastal path, stopping to surf wherever he found a wave along the way. Read part one here. 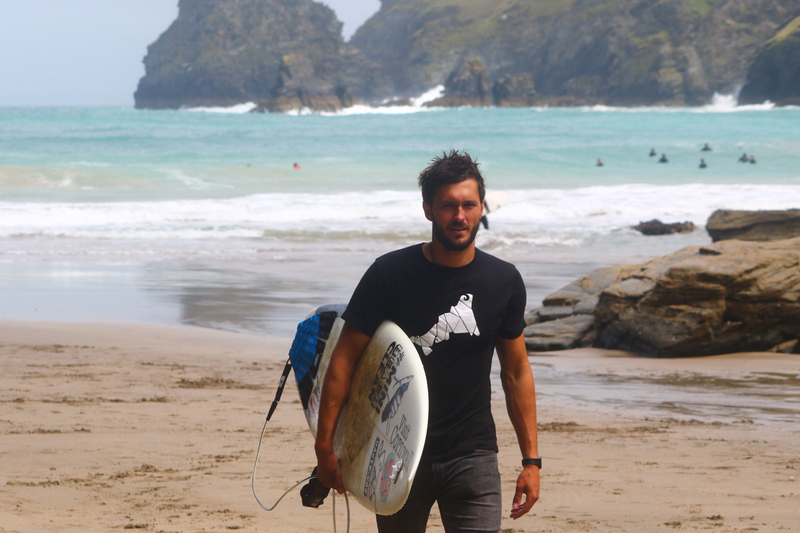 I never suspected that surfing my way around the Cornish Coastal Path would be a simple endeavour. I was at the mercy of the English springtime weather, the fickle swells that may or may not grace the coastline, let alone the physical challenge of hiking over 300 miles on uneven and frustratingly undulating path. With that said, I did not expect to be faced with nearly four weeks of gale force westerly’s blowing out almost every spot on the north coast. 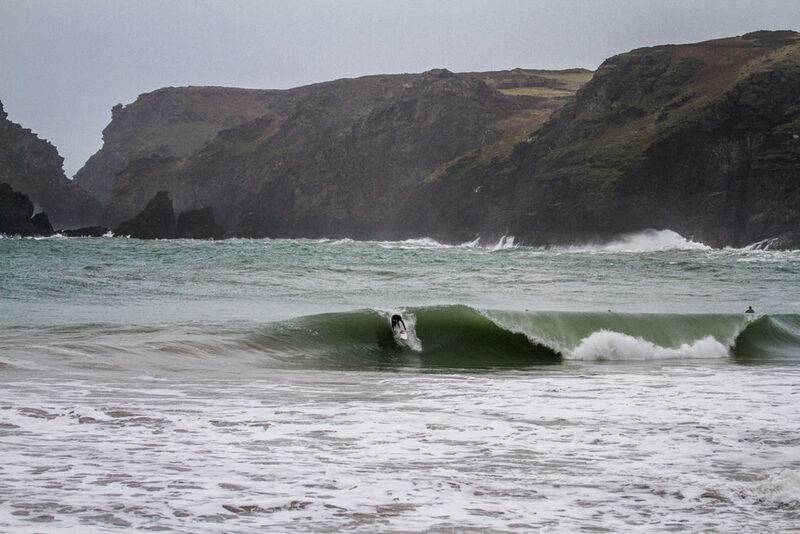 I’d spent two weeks surfing sheltered spots and waiting for tiny windows to paddle out in the bay of St Ives and as I pushed on further north I had to bypass some of the best spots on the coast due to the poor weather conditions. My days became a system of hiking and despairingly sitting in some sheltered corner of the path waiting to see if I had signal to check the forecast charts, seeing if I could see any glimpse of offshore winds or some significant groundswell. It wasn’t until the back end of the trip that things started to show signs of improving. I’d received a tip off of a small hidden spot in the far north of Cornwall that worked in south westerly winds on a big swell, and checking the forecast charts that was exactly what was coming in on my penultimate Friday of the adventure. Climbing down the cliffs in the morning sun, the turquoise blue sea was only discoloured by murky brown silt disturbed by balancing rip currents working off the cliff. You could see this spot would work, there were tiny swell lines wrapping around the distant headland and funnelling into the two adjacent coves before lurching onto some pretty violent sand banks near the rocks. Three three guys were already out, all body boarders, but it was small. It wasn’t worth a paddle out really, and passing some more boarders tentatively stepping down the cliffs I dejectedly headed by up into town. Fortunately I had some friends visiting, and so resting my feet we shot off to another spot just down the coast and had a fun but small surf in clean 2ft closeouts in what proved to be the only spot working that day. The swell was peaking the next morning and the wind was set to hold firm, even if it was a little strong for comfort. We returned the following day to a full car park and descending down the same familiar path the scene was entirely different. A solid swell was breaking, jacking up and lurching over the banks in powerful, hollow sets that were ridden by only a handful of surfers and body boarders in the entire bay. This was what my trip was about! Finding hidden spots, learning from locals and surfing in secluded waves with only a few others out was exactly the concept I’d had when thinking about this journey. Suiting up on the narrow stretch of sand at the base of the cliffs I was paddling in bang on low tide and I suspected with the increasing swell and changing tide that the waves would likely increase in size further throughout the session. I wasn’t wrong, and as if the sea was welcoming me to a new spot in a petulant, arrogant manner I pushed under the first wave and opened my eyes to see a bomb set way out back. 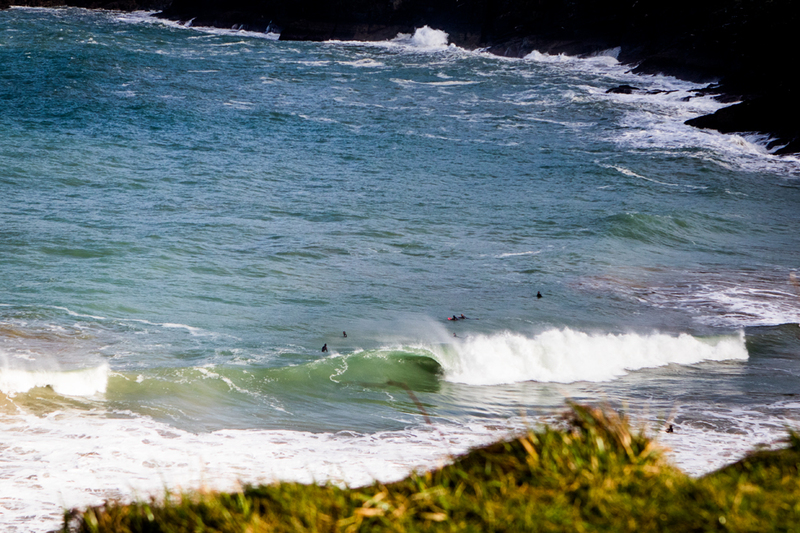 The spot was now pumping and the swell had certainly arrived. It was also getting busier. Every time I looked to shore, more guys were stepping down the cliff path and paddling out into what was quickly becoming a very overcrowded line-up. As I think is always courteous when surfing a new spot, I yielded to the local and experienced guys, sitting inside and watching as a few exchanged fun looking rides into the beach. As another set diffracted around the distant headland we could all see it was visibly larger than anything that had pushed in so far. In unison everyone was frantically paddling to the horizon trying to beat the lip. Cresting over the first wave of the set I knew I was going to struggle. Already dark in colour, the second wave was a breathing, warbling mass of Atlantic Ocean that had me firmly in its sights. I didn’t make it. The lip broke about a metre before me and even my most energetic duck dive couldn’t escape the power. It pushed me deep, really deep, and with my board now somewhere in the ether of salt water and sand I was churned up and over the falls and driven into the sandy bottom on the inside. As the turbulence subsided, drifting underwater in no mans land, I waited for my internal compass to determine which way was up and surfaced after one of the longest hold downs of my life. In the chaos several other guys had had the same fate as me and my leash had tangled with another surfers. As we freed ourselves on the inside yet more surfers began the treacherous but short paddle out. I was done. I was out of my depth and not afraid to admit it. I don’t mind getting schooled if there’s no risk to others or myself but with comfortably 40 guys sitting in a narrow take off zone and having only one board on this trip, there was too much to lose for what was increasingly looking like a heavy and unforgiving wave. Feeling somewhat dejected, we shot down the coast again to another north facing beach that was a little mellower and still working in the wind, feeling far more comfortable in the head high rights that pushed in as the tide followed suit. I felt defeated, but that 45-minute session was exactly what this adventure was about. I’d heard about that spot by chance some ten days before, and then hiked the 70 miles to surf it. I’d gotten a harsh lesson in doing so, but I felt like I’d achieved what I set out to achieve. My trip was nearly over and with onshore conditions looking prevalent over my final week of hiking I resigned that this might have been my last chance for a decent session. With noodle arms and a cringe-worthy grin, I dried off in the early summer sun and took stock of the 250-mile journey to date. I had only a few miles left to walk and had seen the vast majority of the Cornish coast. I could be frustrated at the weeks of onshore winds and lack of quality swell, but after all that is what you get surfing in the UK. Patience is key, and I’d had a handful of really fun sessions in the more north-facing, wild spots where the prevailing winds are offshore. It felt more like a winter surf trip than one through the spring-summer transition. Every session was a battle against the elements, whipping winds releasing deafening spray as the swells unloaded onto the various beaches I’d had the pleasure of passing on my journey. 6 weeks, 300 miles, 15 surf sessions, 3 epic waves and a horrendous t-shirt tan line later I had finished my journey; and I only thought I was about to die once. I’d say that’s a fair return, the only question is; where to next?